As a transfer student and a senior, the prospect of a research assistantship was something I was still seeking out, but my opportunities were increasingly few. However, after taking a biochemistry course focused largely on understanding and researching scientific literature, I was determined to join a research team and begin my own independent study in molecular biosciences here at UT. The opportunity I found was the DIY Diagnostics stream in the Freshman Research Initiative. Even though I am not a freshman, I was encouraged by my former professor to contact Dr. Riedel and inquire about joining his team. After following the news about the Zika virus and the developments in the scientific community, both academic and industry, I was already aware of the work the DIY stream was doing with a viral detection device. I was anxious to meet with Dr. Riedel and find out more about what his stream was working on and where I could fit in to his current team. The project that appealed to me the most happened to not be the Zika research, but the FRIome project. This project is focused on finding correlations between general health and the oral microbiome. Following after the goals and continuing work of the Human Microbiome Project, started in 2008, the FRIome researchers have taken samples of the oral microbiome specifically, through saliva donations, and asked the same participants to answer a general health survey. As a part of this team, I have spent this summer sifting through the metagenomics sequencing results of these oral samples and the accompanying survey responses to glean what possible correlation of diversity there may be with respect to type of bacteria and a certain response. As we learn more about just how much influence our microbiota has on so many aspects of our health and everyday lives, I believe this kind of research is marking a new pathway into the future of healthcare. As a part of the DIY stream, one intriguing goal is to be able to isolate a particular bacteria for its significance, create a biomolecular detection test, and use an app to run and display the test and results on a cell phone. This will enable real-time access to health information, once we can make these correlations. 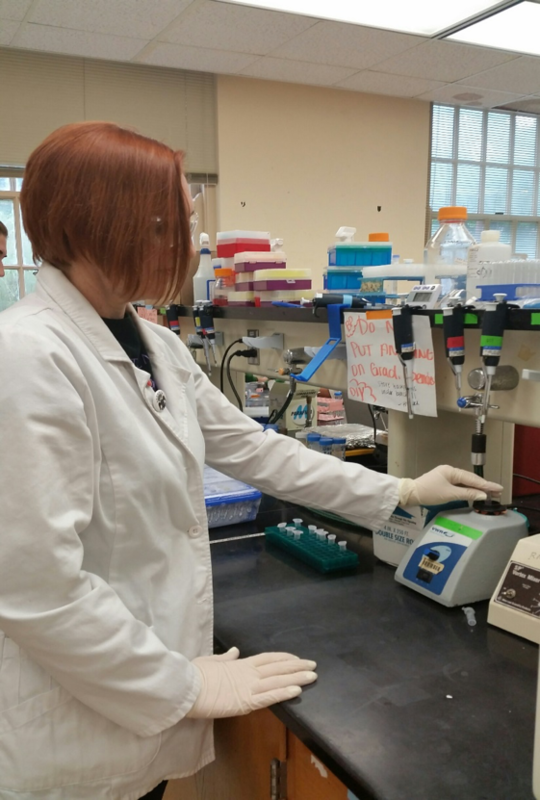 Working in the lab to extract the DNA from the saliva samples, test them for concentration, and prepare them to be sequenced, I have been able to use the skills I learned both in my Biochemistry lab course and my previous work experience as a lab assistant. The real challenge for me this summer has been analyzing the data using statistical methods and programming, some of which I’ve found have been specifically written to accompany metagenomics studies. As I continue into my last year here at UT, I look forward to pursuing this project to delineate a significant link between the oral microbiota and either a general health aspect or even a self-identifying personality trait. I hope that the work I have started this summer will continue to drive my development both as a student and as a future contributor to the scientific community in my career in Biochemistry.